These figs are sprouting everywhere on our street. I just noticed it the other day. Then I read somewhere that these particular trees are common in urban DC. So it gave an idea! 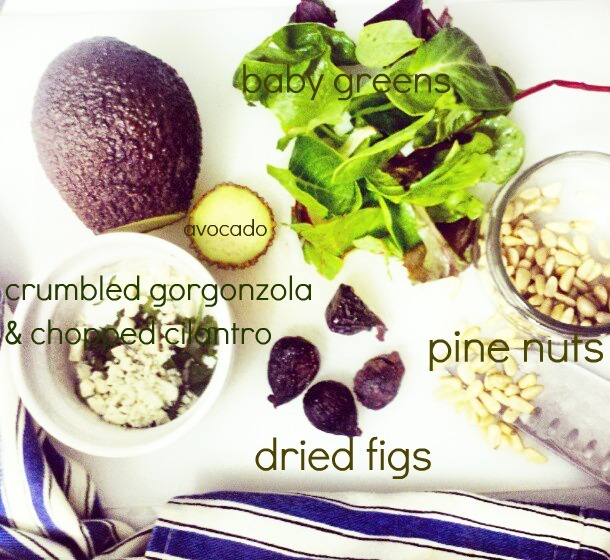 A delicious dish, refreshing, and light that I can prepare using figs. It's so simple. NO measurements required. For dressing: Whisk together olive oil and balsamic vinegar at a ratio of 2:1. Add a teaspoon of Dijon mustard, salt and pepper. If you wish, a squirt of lemon juice gives is a kick. Oh my gosh, how neat to have fresh food available like that! They look so interesting on the tree, too.